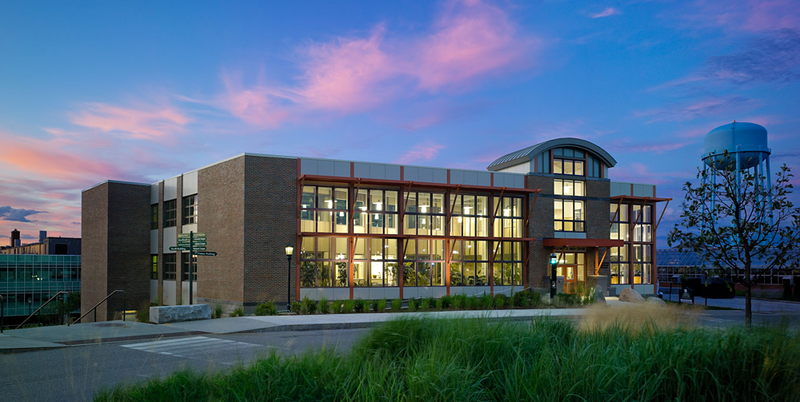 The Aiken Center on the University of Vermont campus is a model energy efficient renovation. A national design competition kicked off the project, seeking a design that embodied the mission of the school of environment and natural resources. The expressed goals were to exemplify responsible use of natural resources, develop an interactive living building, and inspire future generations of learners. The building received a full face-lift, including the addition of a south-facing double height solarium, and a transformation also took place under the surface. Out of view, the building envelope was significantly improved with added insulation and moisture control. On the surface, large windows allow daylight into the previously dark building, offering naturally lit classrooms, offices, and gathering areas. Adjacent to the main south entry, water flows through the EcoMachine® as it cleans 100% of the building's wastewater beside plants thriving in the daylight of the solarium. Local boulders, including ones discovered on the project construction site, anchor the building to the Earth and offer casual locations for students and faculty to pause. FSC certified wood paneling, sourced from UVM's sustainably managed research forest, ribs the interior walls. These natural elements physically link the building and its inhabitants to the School of Natural Resources' educational mission. Located next to a campus green and on the main pedestrian circulation spine through the UVM campus, it is a model for a sustainable future and a "green beacon" for the University, the Burlington community, and its visitors. Local boulders found on the construction site anchor the building to the Earth and offer casual locations for students and faculty to pause. The concept of experiential learning drove the building design and resulted in a laboratory of living systems. One example is the three identical EcoMachines®, each treating one third of the building's waste water, from which data is continually collected and analyzed by students. The organization of the school building was envisioned as an ecosystem with informal gathering areas and visible building systems which function to support a collaborative learning environment and community. The Aiken Center was designed with longevity in mind, providing security for the University's investment into the future. The durable and energy efficient building will ensure decades of longevity and protection from escalating fossil fuel prices. The space was envisioned as a living building. This idea grew from the EcoMachine®, a technology developed by John Todd, a UVM professor, which functions to turn wastewater into clean water. With the EcoMachine® as the seed, the design team modeled the building on a living organism within an ecosystem. The renovated Aiken Center engages the building occupants in learning about sustainability, with local and natural materials, including 27,000 board feet of FSC certified wood from UVM's own sustainably managed research forest, bricks from a Vermont manufacturer, and boulders harvested both from on-site and a local gravel pit. Additionally, a net-metered 71 kW PV system located on U.S. Forest Service land nearby (and financed through a Power Purchase Agreement), produced 110,329 kWh in 2012, which is over 25% of the projected building use. The Aiken Center provides a home to the University's Rubenstein School of the Environment and Natural Resources (RSENR) community, including 600 undergraduates, 130 full and part-time Masters and Ph.D. students, 40 full-time faculty members, and 30 research and administrative staff. The Aiken Center is fully accessible with at grade entrances on the first two levels of the building and elevator access between floors. In addition, the building was designed with functionality and flexibility in mind. While the laboratory spaces are defined, offices were designed for flexibility. Clusters of faculty offices open into small bubbles of open offices, which can be reconfigured as needed to adapt to the changing needs of graduate students and teaching assistants. The Aiken Center's central theme of connecting to natural systems is portrayed in the details of the building. This story is most evident in the recycled content terrazzo floor, which suggests earth, land, water and air. The first floor colors are deep reds and earth tones to mimic the Earth's core. Greens on the second floor are reminiscent of grasses and trees on the Earth's surface. Blues on the third floor mimic the Earth's atmosphere. Finally, a deep blue, water, connects all three floors, cascading down the stairs and flowing in a band through the other floors, a living stream. Terrazzo floors which suggest earth, land, water, and air flow from the stairwell down to the solarium. The Aiken Center proves cold climate renovations are economically viable. At all design phases long-term cost analysis was performed, comparing the capital cost of pursuing energy saving measures with the operations savings that would directly result from these measures. From this long-term financial approach, the Aiken Center proved to be a sound investment for the University. The added cost of a deep-energy retrofit, as compared to simply addressing the deferred maintenance issues in a code compliant renovation was $380,000. When taking into account the anticipated $25,000 per year in energy savings over the existing building, the payback period at 2% fuel escalation, a conservative rate, is 13 years with a 6.6% Return on Investment. In comparison, university officials estimated that a comparable new building would have added $5–7 million to the renovation's $13 million cost. This project demonstrates that existing buildings can outperform the best new buildings at a lower cost. The Aiken Center illustrates one of the rarest project types in contemporary green building, a deep energy retrofit, reducing energy consumption by 63% over the original structure. While the existing building was not a historically significant structure, the goal was to preserve as much of the existing building and its embodied energy as possible in an effort to minimize resource consumption. The resulting building retains the history of the original building, but operates like a new building. One of the major challenges and opportunities of renovating the existing building was that it was a dark and unfriendly place to work. By dramatically increasing the size of existing windows and adding to the total number of windows in the building, the building was transformed into a healthier and friendlier place to work and learn, also increasing productivity. All offices and classrooms now have access to direct, natural light, or have interior windows that allow natural light to pass through from adjacent rooms. This was accomplished through careful programming, removing acoustic ceiling tile, and increasing window heights to allow daylight to penetrate deeper into the building. Light paint colors were used throughout the building and all surfaces above seven feet were painted white to reflect light upward and deeper into the building. Additionally the ventilation system was designed to provide continual fresh air to occupants for the lowest energy consumption. Demand controlled CO&sub2; sensors provide variable amounts of air to meeting spaces to provide adequate fresh air for varying room occupancies. Other spaces use occupancy sensors and/or push buttons to control ventilation rates. Automatically controlled operable windows open when outdoor temperature and humidity conditions met specific set points and amber and green lights located throughout the building tell occupants when the outdoor conditions are optimal to open manually controlled windows. Outdoor picture of the facility during the day. Photo Credit: Photo Credit: Jim Westphalen. Rooted in the educational mission of the client, an integrated, collaborative process highly influenced the final design of this building. This process included the design team facilitating charrettes, teaching classes, and giving presentations. More than 400 students over a ten-year period played a vital role in the project, from selecting our firm in the preliminary design competition to providing input on where to place lighting sensors. One student specifically, under direction from a faculty advisor and Professor John Todd, played an enormous role as the lead designer of the EcoMachine®. Construction activities were carefully monitored to ensure that they conformed to the detailed specifications. Mock-ups of the wall assembly and the window installation were constructed, inspected, and tested. Air infiltration standards played a large role during construction. Installation of each component of the building enclosure was carefully inspected by a commissioning consultant, hired by the University. Final blower door testing proved that the building reached a blower door test result of 0.11 cfm50/square foot of exterior surface area, which is one of the lowest test results for any building, renovation or new, of this size in Vermont. Students will continue to be involved in the operation and monitoring of the building's performance, including experiential learning in the EcoMachine® and on the green roof. Faculty grants allowed for over 200 sensors, embedded in the building and displayed on a monitoring system at the center of the building. These sensors will be used to monitor energy and building system performance on an ongoing basis. The building will be an active living laboratory for research and learning. The design for the Aiken Center followed LEED (version 2.2) for New Construction and Major Renovation guidelines and received a LEED-NC&MR Platinum rating in 2013. AutoCAD was used to document the project, and Carrier HAP software was used throughout design to model projected building energy consumption, as well as to complete the final LEED energy modeling requirements. Material selection for the building was based on life-cycle cost analysis. Whenever possible, materials from the existing building were reused or materials were locally sourced. Much of the existing ductwork was reused for heating, cooling, and ventilation. The mechanical system utilizes outdoor air, when possible, to supplement heating and cooling from the University's central plant and reduce energy loads. The outdoor air passes through an Energy Recovery Ventilator (ERV), which tempers the incoming air by exchanging energy with outgoing conditioned exhaust air. More than 200 sensors and meters in the building measure everything from heat and chilled water consumption from the central heating and cooling plant, to water and electricity use. This information is displayed on a building dashboard where students view, compare, share, interact, and learn. Additionally, a research green roof includes eight separate water sheds for testing micro-watershed strategies for storm water management. This experimental green roof, the first of its kind, will measure what combination of plants and soils does the best job of absorbing storm water and removing pollutants. In the paradigm of a living building, water usage and water savings are as important as energy savings, particularly given the School's natural resource and environmental focus. An EcoMachine® mimics the natural wastewater treatment of a wetland ecosystem. Greywater, an end product of this system, is reused in the building's toilets and urinals. Water savings for the Aiken Center are estimated at 75% better than a minimum code building, with 100% of wastewater treated on-site. Also, the water leaving the building and entering the town sewer system is of greywater quality, reducing the chemicals required to clean the water in the traditional water treatment process. Any wastewater from the building will have reduced phosphate levels, benefiting the Lake Champlain ecosystem. The Aiken project is expected to achieve a 63% reduction in energy consumption over the existing building, reducing the total building load from 89 kBtu/SF-yr to 33 kBTu/SF-yr, with the addition of air-conditioning. This reduction in energy consumption is attributable to the reconstruction of the building enclosure and a reduction in mechanical equipment size. Key components include R-5 glazing, R-32 walls, R-54 roof, and a continuous combined air, moisture, and vapor barrier. The University installed a PV tracker near the building entrance for demonstration purposes, and 17- 4kW PV trackers offsite. In 2011 these trackers produced 102,075 kWh and in 2012 produced 110,329 kWh, which account for more than 25% of Aiken's projected energy consumption and further reduce the EUI to 24 kBTU/SF-yr. The living building, with its connection to natural systems, generates a healthy environment for occupants. Daylight and views are maximized, and operable windows allow natural ventilation when outdoor air conditions are appropriate. Indoor air quality is further controlled by mechanical ventilation tied to CO2 sensors, adapting to changing occupancy levels. Materials and finishes with low or no-VOC content were selected. Users are able to control their environment through shades, light reflecting blinds, and operable windows. Panoramic view of the building exterior. From the mission of the school, a vision emerged that exceeded the expectations of the University. Engaging students and users in the design, operation, and systems of the building encourages stewardship for the building that heightens awareness and extends to the broader campus. Through careful consideration, planning, design, and implementation, this building proves that it is possible and cost-effective to produce renovation projects that are as high performing as the best new building projects, with a lighter footprint. The resulting building, shines as a "green beacon" for the University, for Vermont, and educational institutions nationwide.